If you have facial swelling combined with a toothache, you might have a tooth abscess or a gum abscess. Adelaide Dental can treat the infection and provide you with pain relief. What is an abscessed tooth or gum? An abscess is a collection of pus that has accumulated in response to bacteria, parasites or other foreign materials. Tooth abscesses are usually located in the root tip, while gum abscesses are usually located along the root of the tooth. Sometimes mixed abscesses, which combine tooth and gum abscesses, can occur. Abscesses are a defensive reaction of the body to prevent the spread of infection. They can happen due to bacterial infections, trauma, nerve inflammation and the presence of foreign bodies. What are the symptoms and risks of having an abscessed tooth or gum? If you have an abscess, you may experience shooting pain, a swollen face, discomfort on biting down, a headache or pressure. The risks of not treating a tooth or gum abscess include gum or bone damage. Until you are able to see the dentist, you should keep the area clean by rinsing with salt water and avoid chewing on the affected side. If you are in pain, you can also take an anti-inflammatory such as Advil, unless you are allergic. The dentist must determine the reason that the abscess formed before recommending a course of action. Immediate treatment typically involves draining the pus and prescribing antibiotics. 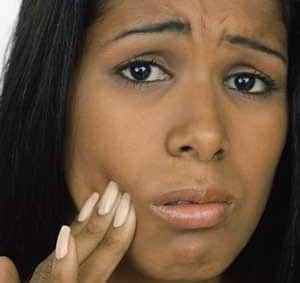 Do you have a tooth abscess?